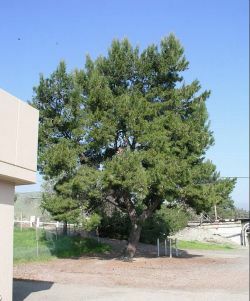 Comments: Evergreen conifer native to groves in Monterey, San Mateo, Santa Cruz and San Luis Obispo Counties in California. Three 4" to 5" long green needles per sheath, on red to brown stems. Bark on trunk is brown but graying with age. Tree conical to cylindrical with flattened top in older trees. This species is widely planted throughout the world.